On Saturday night, May 20, amidst noise-makes, placards and banners, a crowd of nearly 800 jumped to its feet in appreciation of 10 community leaders stepping out of their comfort zones in order to raise funds for Stamford’s longest-running, and only, year-round, nonprofit producing theatre company: Curtain Call. Curtain Call, now it its 26th year, celebrated at the organization’s tenth annual Dancing with the Stars event and kicked off the night with a reunion dance including 18 past volunteer dancers, choreographed by one of the event’s founding dance professionals, Lou Lopez, of Latin Moves Dance Studio. The energy and excitement…not to mention the noise level from cheering …was akin to what was seen at last summer's political conventions...but a lot more fun! 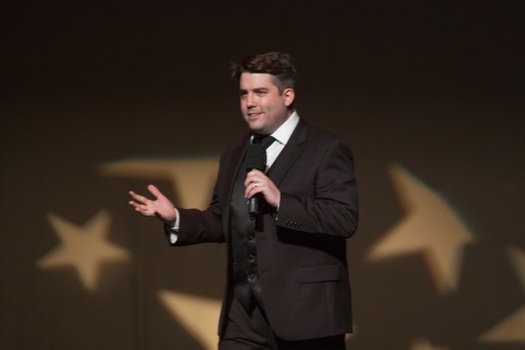 Leading the cheering as host for the event, was Stamford resident, Curtain Call alumnus, and Broadway veteran, Chris O'Neill, who recently completed four and a half years starring in The Book of Mormon. O'Neill's quick wit and charming personality kept the show moving and helped make the dancers feel very comfortable on stage. Timothy McGrath-Dimare (STAMFORD), a true renaissance man, along with his professional dance partner, Iraida Volodina (from Arthur Murray Grande Ballroom of Greenwich, whipped up a dance routine worthy of the JUDGES' CHOICE AWARD (male division), at this annual fundraiser held at the Palace Theatre, Stamford. McGrath-DiMare, among many vocations, is a cake decorator at the family business bearing his name: DiMare's Pastry Shop. Stamford resident, court reporter and professional singer, Sharon Jerry-Collins, and her professional dance partner, Billy Blanks, Jr., of Arthur Murray Grande Ballroom in Greenwich, bopped across the dance floor with a mixed routine with a Bollywood influence, and won the JUDGES’ CHOICE AWARD (female division). In recognition of his outstanding fundraising efforts for the event, Darien resident and owner of Hung Wells Signs, Kevin Kane, received the PEOPLES’ CHOICE AWARD. His professional dance partner, Suzanne Vita Palazzo, Upper Deck Fitness, created a fabulous routine that they definitely were not hung on. This fun-filled fundraiser began at UConn Stamford with a cocktail party feting all of the dancers. A wide array of food and beverage were provided by Amore Restaurant, Bareburger Stamford, Boothbay Lobster Company, Chocolate Works Darien, Columbus Park Trattoria, David's Soundview Catering, DiMare Pastry Shop, Nikki Glekas Events, Eventi Cafe, Marcia Selden Catering, Myrna's Kitchen, Palmer’s Catering, Parkway Diner, Riko’s Pizza, Sushi Village, Sweet Lisa’s Exquisite Cakes, The Water’s Edge at Giovanni’s, Broken Shed Vodka, Crystal Rock, Stamford and Heineken. For this year's event, in addition to McGrath-DiMare, Jerry-Collins and Kane, other participants included: Garry Feldman, President, US Computer Connection, with professional dance partner, Donna Fox, a Curtain Call Choreographer; Angelo Nunzio Grieco, Owner, Sunny & Frankie’s, with professional dance partner, Lauren Nicole Sherwood, Diva Star Productions; Kevin Kane, Owner, Hung Well Signs, with professional dance partner, Suzanne Vita Palazzo, Upper Deck Fitness; Harriette Ketover, with professional dance partner, Bob Blank, Latin Moves Dance Studio; Yve Novotny-Gentile, Owner, Garden of Eve Interior Design Owner, with professional dance partner, Hazael Rojas, Latin Moves Dance Studio; Charles Pia, Owner, Charles R. Pia Construction and Property Management, with professional dance partner, Becca Brendli, Independent Choreographer; Sonia Sotire Malloy, Owner, SPLURGE Unique Gifts and Home Décor, with professional dance partner, Cuong Nguyen, Arthur Murray Grande Ballroom of Greenwich; Robin Wexler, Special Events Manager, Gilda’s Club Westchester, with professional dance partner, Pavel Bic, Arthur Murray Grande Ballroom of Greenwich. "Each year I am totally overwhelmed by the community’s support for this event," said Ursone. "Arts organizations locally and nationally continually struggle to make do with less, especially in terms of providing reasonably priced programming for their communities. We know how very fortunate we are to keep our lights burning," he said. The economy is still very challenging for all nonprofits, so it takes special events like this to keep Curtain Call and other charities in business. Arts funding at the State level for Curtain Call has been reduced by more than 80% over the past six years leaving funding gaps for arts organizations throughout the state. Co-chairs for the event were Robin Selden and Jami Sherwood, both of Stamford. Each is a Curtain Call Board member and was a volunteer Star Dancer at a prior dancing stars event. Sherwood said "Dancing in 2008 - the first year - was such an incredible experience...I never thought I would have so much fun doing this. It has made getting each year's line-up of volunteer Star Dancers psyched, very easy," she added. Selden noted that "Each of our volunteer dancers, amateur and professional alike, were completely committed to this event and that made our jobs so much easier." Selden is responsible for corralling her colleagues in the hospitality industry to provide the incredible array of food and drink offered each year at the pre-show cocktail party. Both women were thrilled to get back on stage as part of the reunion dance that opened the show. A major part of this event – patterned after the popular television show - is the video component which included behind the scenes rehearsal footage. Volunteers, David Klein, Robbie Sherwood, and William Squier masterminded the production of the videos that showed the dancers laughing at themselves through the rehearsal process. Judges for the event included Jimmy Locust, former Michael Jackson and Janet Jackson dancer and the owner of Locust Performing Arts Center, Maureen Pavia, director, Dancing Classrooms, and Ben Frimmer, a long-time Curtain Call director, performer and theatre educator. All three have judged this event in the past and had nothing but praise for all 10 couples. "Planning for this year's event started the day after we held our last event," said Sherwood. Other committee members included: Diane Arditti, Dominic Bria, Bob Callahan, Lynne Colatrella, Nicole Faugno, JoAnn Latorraca, Betsy Mercede, Lori Mercede, Tom Ormond, Bill Squier, Jan Ursone, Lou Ursone and Gail Yudain. "Our board, staff and a large group of amazing volunteers continue to make this event the premier special event in the area each year," Ursone said. More than 50 volunteers were on hand to make this event flow smoothly. Curtain Call is the nonprofit community-based theatre company in residence at the Sterling Farms complex, 1349 Newfield Avenue in Stamford. Year-round productions and workshops are presented by and for area residents in The Kweskin Theatre and The Dressing Room Theatre as well as outdoors on the great lawn for its annual Shakespeare on the Green presentations. Curtain Call was voted Fairfield County's BEST LOCAL THEATRE GROUP ten years in a row in the Annual Readers' Poll of The Fairfield County Weekly as well as BEST LOCAL THEATRE and BEST PERFORMING ARTS GROUP by StamfordPlus and Stamford Magazine, respectively, for the past several years. Curtain Call also received The Governor's Award for Excellence in Culture and Tourism - 2011 and last year, was awarded the first ACE AWARD for excellence in the Arts from the Cultural Alliance of Fairfield County In a statewide Facebook poll in August 2012, Curtain Call was the state's favorite theatre site. For more information on upcoming shows, workshops and daytime summer youth programs, call 203-329-8207x11 or go online to www.curtaincallinc.com.